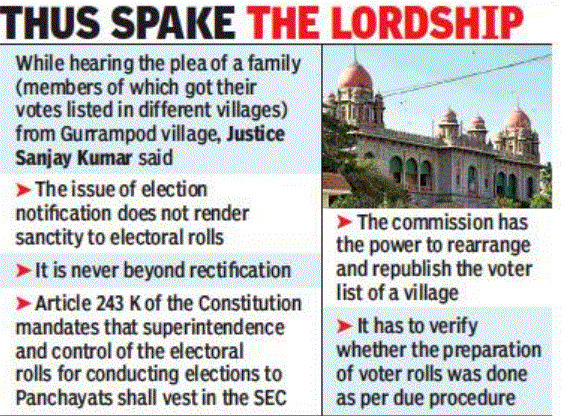 HYDERABAD: Sending shock waves across the bureaucracy, the Telangana high court on Friday made it clear that the issuance of election notification for the Panchayat polls would not be a hindrance to rectify the discrepancies in the voter lists and directed the State Election Commission (SEC) to correct the mistakes that have crept into the voter list for Gurrampod village in Nalgonda . The court gave this direction after noticing that a small family of three members was given votes in two different wards in the same village. The SEC has to supervise the electoral rolls prepared by the district panchayat officer (DPO) and cannot mutely accept all that was forwarded by the DPO, the High Court said, adding that the SEC had failed in its job in the current case. “You have to correct the mistake. If you find it difficult to do so before the first phase of election, you can do so by shifting this village into the second phase of polling. But you should do it before polling,” said Justice Sanjay Kumar, who was hearing the grievance raised by Mantipalli Durgaiah, a farmer, his wife Yadamma and daughter Mamatha, all of whom live under one roof in the Chamaloni Bavi area of Gurrampod. The petitioners questioned the action of the officials in going ahead with the election process without first disposing of the representation given by the pleaders. In fact, there are scores of such discrepancies in the voter list of this village, the petitioners’ counsel said, pointing out that if the husband is contesting as a ward member, his wife and daughter will not be able to vote for him because they are voters of a different ward. The judge perused the record and found that the grievance of the petitioner is genuine. All the three petitioners are residents of the same house, but the father’s vote is in Ward No. 3, whereas his wife and daughter are shown as voters in Ward No. 6. While directing the SEC to take remedial measures for delineating voters ward-wise, on a geographical basis, as required under the rules, Justice Sanjay Kumar said that judicial intervention after poll notification in respect of voters list would, in effect, promote the election and not prevent it.